Dabo Swinney’s Christianity is Clemson’s marketing tool. Why the Clemson coach’s Christianity is a big part of the Tigers’ success. 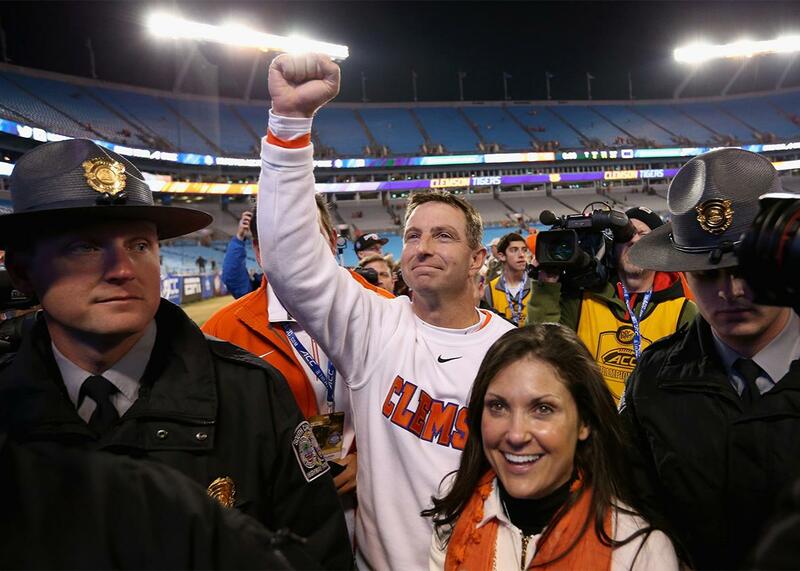 Clemson Tigers head coach Dabo Swinney celebrates after defeating North Carolina in the ACC football championship on Dec. 5, 2015, in Charlotte, North Carolina. Up until this year, it was mostly easy to overlook the existence of Clemson Tigers’ coach Dabo Swinney. His program had been in the midst of a protracted era when Clemson developed such renown for losing crucial football games that the Tigers inspired their own slang word for failing in the clutch. Meanwhile, Swinney was not even the most charismatic football coach within his own state’s borders; that was South Carolina’s Steve Spurrier, a playful trickster and inveterate trash-talker who would manage to verbally tweak Swinney several times a year. That balance of power, however, shifted decidedly this fall: A floundering and aging Spurrier up and called it quits, and Swinney, at age 46, has led his team to a 13–0 season, a victory over an FSU team that had beaten them time and again, and the No. 1 seed in the College Football Playoff. On New Year’s Eve, the Tigers face Oklahoma for a spot in the title game and a chance at Clemson’s first national championship in 34 years. Suddenly, Swinney is one of the hottest college football commodities in America. And perhaps not coincidentally, in a profession that traditionally lauds piety and conservatism, he may also be the most religiously devout coach in the country. This has engendered controversy among outsiders who have decried the problematic notion of a football coach at a public university embracing evangelical principles, but for Swinney, it is a natural fit, a way of both reinforcing his personal beliefs and marketing his program. It’s also a savvy embrace of the values that have long defined college football in the eyes of Southern fans. Swinney was born in Alabama, the son of an alcoholic father; he walked on to the Alabama football team, became a full-time assistant, got his MBA, and eventually wound up at Clemson, where he coached under another evangelical Christian, Tommy Bowden. When Bowden was ousted in 2008, Swinney became the interim coach, and won the job by introducing a new tradition—the “Tiger Walk,” in which players and coaches make a pilgrimage through the parking lot before each home game—and by beating rival South Carolina to become bowl-eligible. From the beginning, Swinney made no apologies for his Christian values, nor was he required to, given that he was coaching in a region that has traditionally embraced those values. But what sets Swinney apart from many of his colleagues is that he has infused that evangelical spirit into the very fabric of his program. In 2012, wide receiver DeAndre Hopkins was baptized in a livestock trough at the 50-yard line following a practice. Swinney has team chaplains and “voluntary” chapel services. According to a 2013 profile in the Chronicle of Higher Education, at Clemson, a state-funded institution, “God is everywhere.” The story led to a letter of complaint by the Freedom From Religion Foundation that Swinney was violating the Establishment Clause of the First Amendment. Swinney responded by insisting that he doesn’t impose his values on anyone, which may technically be true but could easily be viewed as a semantic distinction. Not since Bill McCartney’s open embrace of Christianity in the 1980s and early 1990s has a football coach at a public university been so open about his proselytizing. The major difference, of course, is that the University of Colorado’s McCartney was coaching in Boulder, a town infused with hippie-ish liberalism; Swinney is in Clemson, a place where college football and religion and have long defined the identity of the region. Someone like Swinney fits neatly into this paradigm at Clemson, far more than McCartney ever did in Boulder. This season he has embraced his televangelist role, spreading the gospel of Clemson near and far by delivering pointed sermons against his school’s purported reputation for choking, by coining the T-shirt worthy mantra BYOG (for “bring your own guts”) to describe his team’s grittiness, and by repeatedly dancing in the locker room after victories. A large part of what made McCartney a national-championship coach at Colorado was his ability to sell himself and his program to parents who might have otherwise sent their kids to Oklahoma or Nebraska, often through a direct embrace of the Bible (in a recent ESPN 30 for 30 documentary, McCartney said he would sometimes read Scripture with the parents of recruits). Everything Swinney has done this season can be seen both as a way of proselytizing to his team and as an MBA-worthy method of advertising Clemson to devout parents of potential recruits in a region rich with football options. Win or lose against Oklahoma, the Tigers have an identity now. Maybe Swinney’s brand of piousness wouldn’t take hold as freely in the Big Ten. Maybe he doesn’t possess the corporate gravitas of Alabama’s Nick Saban or the offbeat-genius aura of Auburn’s Gus Malzahn. But he is an optimal fit in a place where football is a civil religion. If you have a problem with that, Swinney says, you don’t have to be here, and he says this knowing full well that the majority of his parishioners have no problem with it at all.